In case you haven’t already heard, there’s a total solar eclipse coming to North America on August 21, 2017. In the path of totality, viewers will be in the shadow of the moon for about two minutes. What most people don’t realize is that for about an hour before and an hour after totality, a partial eclipse will be visible. In fact, at least an hour’s worth of viewing time of a partial eclipse will be visible from anywhere in the United States, regardless of whether you are in the path of totality or not. What are you going to do to get excited about this thing, and how will you get the most out of all of that partial eclipse time? Throw an eclipse party, obviously. An eclipse is a reasonably rare event, shouldn’t it be celebrated? You can host an eclipse preparation party the weekend before and make pinhole viewers with your friends, you could give away eclipse model necklaces as party favors, and reflect on the experience of totality by crafting corona art. The sky’s the limit! Here are some of our favorite party activity ideas. Give them a try. And remember, never look directly at the sun! Concept: The earth is about three times as wide as the moon. The earth and the moon are about 30 earth-widths away from each other. Using these basic rules of thumb, it’s pretty easy to make a model of the earth-moon system. Not only is this a great opportunity to model an eclipse at the correct scale, this necklace version of a scale model is totally astro-chic. Materials: Modeling clay that can be baked (like Fimo), string, safety pin, scissors. Alternatively find two sizes of beads – one small kind of bead, and one about 3x larger in diameter. What to do: Using the ratios above, use modeling clay to sculpt a tiny moon. Use a different color to make a tiny earth about three times as wide as the tiny moon. Use a safety pin to poke a hole through each, then bake until they are hard. Measure out a piece of string or yarn that when folded in half is as long as 30 of your earth’s lined up together, plus some extra for knotting. Thread your string through your planet and moon, and tie into a necklace. 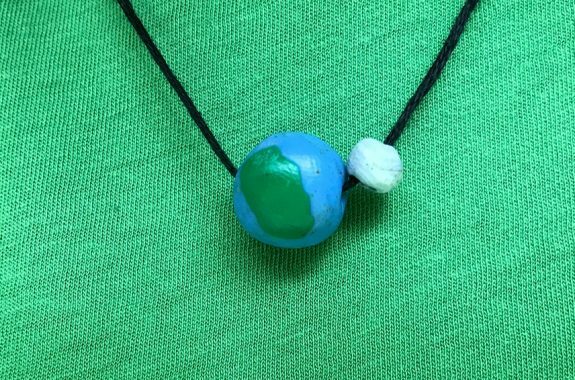 When you are ready to model an eclipse, take off your necklace and hold the earth and moon at opposite ends of the necklace, then line them up with the sun so that the moon casts a shadow onto the earth. You’ve made a solar eclipse! Concept: The sun’s corona is only visible from earth during a total solar eclipse. Lucky for you, there’s one coming up! Why not create a piece of art to document your coronal observations? What to do: Observe the total solar eclipse, or, if you’re not in the path of totality, stream it live from NASA’s website. Try to observe the sun’s corona and remember what you see. On a piece of black paper, trace or draw a large circle with white chalk. Use your fingers to smudge the chalk outwards taking care to replicate the pattern of the corona that you observed during the eclipse. Concept: Pinhole viewers focus and image by giving light a very narrow opening to travel through. The focused beam of light is then projected onto a viewing surface or screen. Pinhole viewers are literally thousands of years old, yet a pinhole viewer is still one of the best methods for safely and indirectly viewing the sun during a partial eclipse. What to do: Poke a tiny hole in one side of a box. Cut a piece of white paper so that it fits inside the box on the opposite side, place it inside and secure it with tape. Cut a small viewing hole a few inches away from the pinhole on the same side, so that you can look in and see the white paper. With your back to the sun, hold the viewing hole up to your face, then turn and tilt until the pinhole faces the sun, and an image of the sun is projected onto the white paper. During a partial (or before and after a total) eclipse, the sun’s light will appear as a crescent! Learn More: Check out this list of pinhole viewer examples we’ve put together, and view NASA’s information on pinhole projectors. Concept: Photosensitive paper undergoes a chemical change when it is exposed to sunlight (and example of photochemistry), and can be “developed” like film simply by dipping it in water. Adding photosensitive paper to a pinhole viewer will give you a semi-instant keepsake of the eclipse! What to do: Place your viewer in a location and position where it won’t move, but will still project the sun’s light onto the screen. 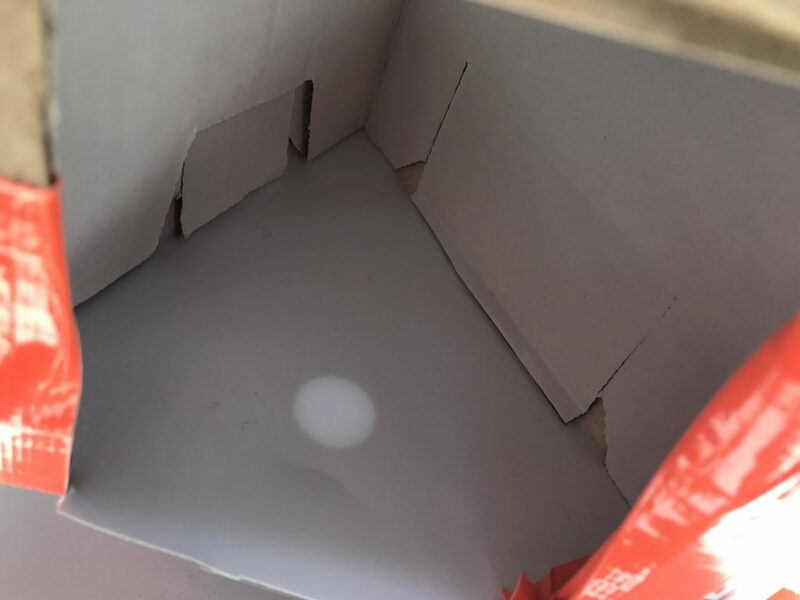 Carefully, without exposing the photosensitive paper to light, place a piece of the photosensitive paper inside your pinhole viewer where the spot of light is projected. Leave it in place, with the projection of the sun on it, for 1-5 minutes. Holding it by the edges, quickly remove the photosensitive paper and place it in a tray of water to let it develop. Concept: After researchers collected many observations of solar wind in space, a data specialist figured out how to “sonify” the data, or make it into sound. He recorded this “music” alongside an audio track, unintentionally creating the perfect soundtrack for an eclipse party! Materials: This track, called “Sun Song” and some speakers. Learn more: Listen to this interview with scientists who sonify data, including the group that created the sun music above. Concept: The moon is a major player during the solar eclipse – it wouldn’t happen without it! Model the cratering process that gives the moon it’s unique topography by smashing paint covered “asteroids” onto the surface of a “moon.” If you are in the path of totality, you’ll see one evidence of the cratering on the surface of the moon: Bailey’s beads. As the moon slides into place in front of the sun, the valleys on the surface of the moon are the last places that the sun’s light can break through, appearing as a string of illuminated “beads” around the edge of the eclipse! What to do: Draw a circle on a large piece of butcher paper or a plain T-shirt – this is your “moon”. Dip the balls in paint and let fly, cratering the surface of your moon with objects approaching at different speeds and angles. Note how size, speed, and angle affect the shape of the “craters” that form! Learn More: This is a simplified version of an awesome activity developed by NASA’s International Observe the Moon Night. Launch water balloon asteroids at the "moon"
Image by Andrea Jones, LRO Education and Public Outreach Lead, NASA. Concept: Just like with crater art, you’re going to model the crating process that occurred on the moon in the past, only this time you’ll do it with water balloons! Materials: Water balloons, large swath of dry pavement, tape measure (optional). 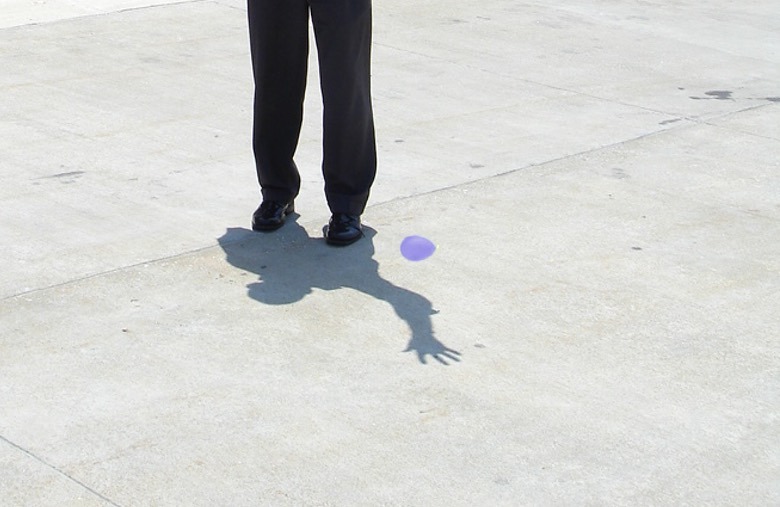 What to do: Launch water balloon asteroids at the lunar surface (pavement). Note how size, speed, and angle affect the shape of the “craters” that form! Learn More: Learn more about the moon’s history of bombardment and check out how to make this a quantitative data collection activity in this amazing resource from International Observe The Moon Night. Concept: The best way to figure out what happens during a solar eclipse is to model your own eclipses – as many as possible – with friends and family through song, dance, props, and of course, by documenting it with a camera. Materials: Any two objects, but basket, base, tennis, and golf balls work great. What to do: Make a basketball eclipse with a basketball and a tennis ball, or make a automotive eclipse by eclipsing a car with a golf ball – the possibilities are endless! Remember that an eclipse is named after the thing that is obscured from view. “Can you use a really small object to eclipse something much larger? How did you do it?” Try recording your eclipse with a smartphone.